View from the Mount of Precipitation looking north at Nazareth. In the center of the image notice the Basilica of the Annunciation. Notice the hill/ridge on the horizon. 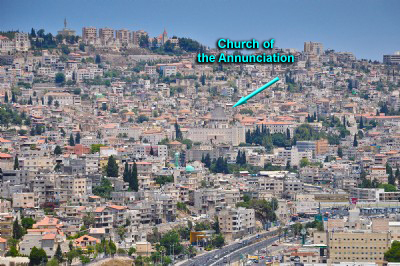 Ancient (NT) Nazareth is located near the Basilica of the Annunciation that is built over the tradition site where the angel Gabriel appeared to the Virgin Mary—in the bottom of the "bowl." Today 80,000+ people live in Nazareth proper—70% Muslim and 30% Christian.